Alex oniugnip and I played our first show in Bloomington last night. Actually, it was Alex's first show ever! He was a little nervous, but he did great. We did eleven songs, including a Weakerthans cover. Supposedly, everything was recorded, so if that recording materializes, I might revive the podcast. 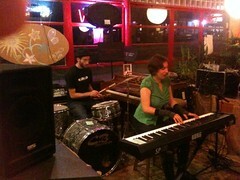 Thanks to the fine folks at Rachael's Cafe, we got to open for Abigail and Shaun Bengson, who are amazing. They just moved to Bloomington from NYC and plan to use it as a home base for touring. This is more evidence supporting something that's been on my mind lately: Bloomington is like a startup hub for bands. The more I think about it, the more it makes sense. We have a world-class music school; we have a population of people who are interested in going to shows; you can live here on the cheap; and it's centrally located for touring around the country. You can barely walk down the street here without running into a musician; you can't bike around town at night without hearing people practicing. It's pretty great. Anyway, we spoke to the guy who does booking and promotion for the Bengsons, who seemed open to the possibility of getting us to open for them again, perhaps in a month or so, depending on their schedule. I'm looking forward to that. Abigail and Shaun are also married, and they're clearly Into Being Married. After the show, Alex was conversing with Abigail, and I overheard her asking him with regard to us, "Are you in love?" Not, you know, "Are you boyfriend and girlfriend?" or something, but "Are you in love?" Cutting right to the chase. I like that. Besides, "boyfriend" is such an insufficient term. I mean, I've had boyfriends before.